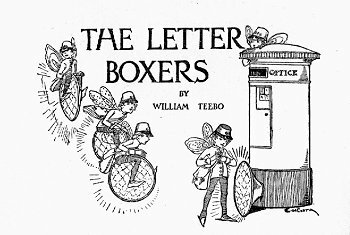 You must have seen them--the letter-boxers, I mean--hiding round corners, and then rushing up to pillar-boxes, and, after taking out all the letters, hurrying away with them in a sack! They do it mostly at night, when there aren't so many policemen about. Of course they are really goblins. You might not know it if they are walking, but when they've got those flaming red motor-cycle things to ride on, and the flashing lamps they have for getting in policemen's eyes and dazzling them, you can tell at once. Perhaps you have never thought that if it were not for the letter-boxers we should not get any letters. But we shouldn't, and, for one thing, mummy would never have been able to read this story to you. It would not be the least little bit of good pushing a letter in the box: it would just stay there forever. And, of course, it is frightfully dangerous work! You see policemen-and other people as well-pretend the don't believe in goblins or fairies, and they think if they could only catch all the letter-goblins and put them in prison, nobody would believe in the letter-boxers anymore. As soon as no letters came, everyone would say, "There aren't any fairies, don't you see?" If you look you will see "G.P.O." on the letter-boxers' caps: G.P.O. is the letter-boxers' King, and he is very, very wonderful. 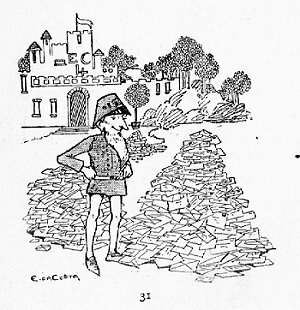 He lives in a great palace called "E.C.4," and after the letter-goblins have teken all the letters back there, he sorts them out and sends them to the right houses. Well now, when you see a letter-boxer hiding round a corner, just smile at him and whisper-ever so whispery, in case a policeman were near-"I hope you won't get caught, Mister Letter-boxer!"